Growing up with tea, I was not a fan. The green tea would grow bitter in my paper cup at Coffee Hour at my church, requiring me to drown the bag and liquid in a deluge of sugar and milk. I could continue to sip anyway, though, in an effort to be “healthy” (though I must admit, I doubt there was much health left in that cup). I got my health in other places – all the vegetables that I would eat, the gallons of milk that my brother and I would finish within a few days of purchase, the fruit (especially grapes) that would magically disappear in a night – but something about green tea, despite the taste, always drew me in. If only I had read the package to see that I was supposed to take the tea bag out, I might have liked tea a little earlier. Then I discovered new teas. Black teas and herbal teas caught my eye, in particular. Black teas because though they always had the same strong undertone, they were also so versatile with the fruits, flowers, and oils added in. Herbal teas because of their sweetness, like juice, but better for you. I would buy tea bags by the bulk whenever I went to the Asian Food Market. I would steal tea bags from the cafeteria from college. My friends knew about my tea addiction and would tease me about it. When I got back from college, I remember sifting through the cabinets one day and finding a mason jar full of dried flowers. Curious, I took a sniff. Chrysanthemums. I later found out that my mom would drink it when she could not sleep. I thought I was the only tea-drinker in the family. For some reason, this simple thought made me feel at peace, a little closer than I was before. It might not seem like much, but to me, it meant the world. Not finding a job right out of college definitely hit me hard, both self-esteem and wallet. I kept applying every day, working at my normal job, but never moving forward. I knew I had to do something. I would write articles for online news sources. I would call and apply everywhere. I took a job where I would only work three hours a week for minimum wage with a thirty-minute one-way commute in an effort to just get my name out there. Nothing felt like it was working. So, I decided to start a blog, and Tea Love was born. It has been moving steadily ever since. I had boyfriends who would try and work with me on my tea habit. One would try and surprise me with teas he would be sure I had never had before and then present me with an apple cinnamon tea (but at least he tried!). My current boyfriend and I share our love of tea. He accompanies me to Tea Love talks, we often indulge ourselves by curling up with the television and drinking warm cuppas. His eyes light up like mine when we talk about tea. And he knows that when I am crying and cannot be consoled, that a warm cuppa will mean the world to me. It has been a few years since Tea Love came about. It has been many years since I started drinking tea and enjoying it. I research, I read, I learn, and I grow. I hope to one day write a book about tea. In the meantime, I will be content curling up with my cuppa and watching the world go by, knowing that I will make it in the world with a warm cuppa in hand. I adore my philanthropy work. I work at a job where I feel like I am making a difference in people’s lives, I constantly assist at my church (maybe to a fault! ), and am constantly coming up with new and innovative ways to better the world around me, especially for the homeless population and those that suffer from hunger. I also adore my tea. A nice cuppa after a crazy day at work is relaxing and gets my mind away from any evil thoughts that might infiltrate, ranging from depressing, lonely thoughts to, “Did I remember to do that thing I wanted to do today?” thought. While I drink coffee, that revs me up and keeps me moving, while tea rocks me gently into a certain bliss. Mix the two together, and I am in love. 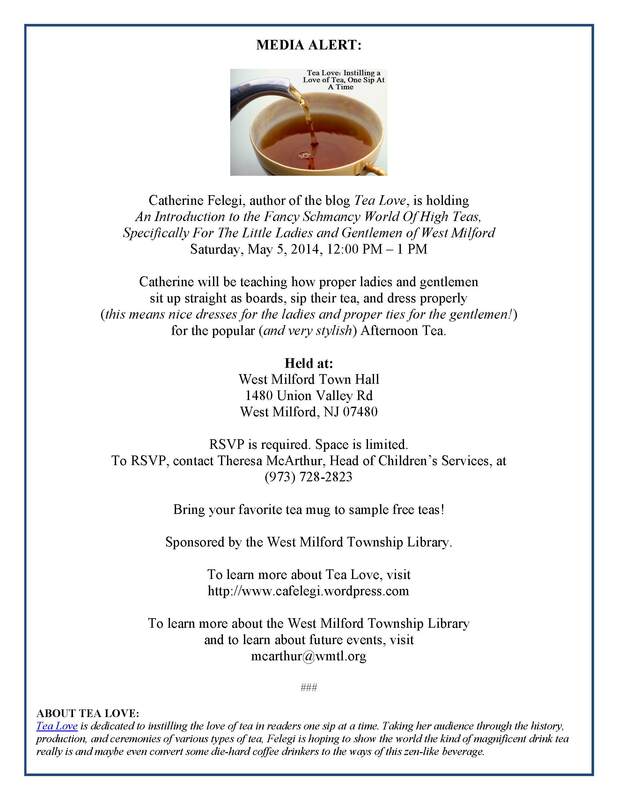 On Saturday, April 25th, for example, I am going to be heading up to Ringwood Library, 30 Cannici Drive, Ringwood, New Jersey 07456 for a high tea fundraiser. There, I will be explaining all about high teas and offering samples. Tickets are $20 for Friends of the Library members and $25 for non-members. For more information, you can visit the website or contact Elise Bedder at (973) 962-6256, ext. 15, or email her at bedder@ringwoodlibrary.org. All proceeds benefit the library. Another good thing to think about with your tea is Fair Trade. GOOD Magazine wrote a news article on the whole idea of being Fair Trade. Being that tea is the second most consumed beverage in the world and the sixth most consumed in the US, everyone should do their part to give tea growers a good life. Thankfully, Americans are doing just that. Tea consumption is on the rise and per Fair Trade USA, between 2012 and 2013, Fair Trade Certified teas (produced by cooperatives and farms) imports jumped by 26%! Given that tea consumption in the US has quadrupled since 1990, that is HUGE. But what does it mean to be Fair Trade? To get Fair Trade Certified, a company must ensure that the farmers receive safe working conditions as well as sustainable wages and fair capital. The capital is determined by the prices set for the products. Workers also get a premium (the extra price that a consumer pays for a product that a consumer pays for a product that goes back to the farm source), which they can choose to invest back into the farm or the community. The work is very strenuous and is often done by working mothers, many of whom tend the fields with their babies still on their back. In some circumstances where companies are not Fair Trade certified, these women are getting paid $1.35 a day, not enough to feed their families. Some even have to resort to human trafficking and sending children to bigger cities for the possibilities of better work opportunities. However, Fair Trade certified companies do not have that. When a company becomes Fair Trade certified, the farmers democratically decide how their Fair Trade premiums. In India, this often goes into college scholarships or retirement funds. In China? This goes to building school dorms, building roads, installing gas stoves, or building sanitation facilities. While being organic is not required, many companies go this route. All the same, Fair Trade certification enforces environmental standards to help maintain healthy living conditions and working conditions, such as restricting the use of pesticides and fertilizers, banning GMOs, and protecting water resources. So do yourself, farmers, and the world a favor. Buy Fair Trade. Help the farmers, help the earth, and make your heart smile. So, I just posted on Facebook about how I had not been posting lately, and for that, I truly apologize. Things have been crazy, to say the least. Of course, there is the typical Christmas-time cleaning and running around. Throw in that mix Operation Warm Heart, to help the homeless (worth mentioning that at the first program, one of the guests enjoyed tea so we were swapping tea facts), and some health things going on, and I just haven’t been able to sit at the computer to do too much. Well, decided to update my blog after seeing an eye-opening comment on my Facebook page how a person was unfollowing me due to content that was not relevant! I do apologize for that! And now, I write something about tea as well as something related to health – what does tea do to cysts? First, let’s start on the ovarian cyst. For those that do not know, a cyst is a fluid-filled sac that sometimes forms. According to my doctor, most women get them and do not even realize it. They are normally seen through other scans. If a cyst is bad, you can get some symptoms. Mine, they are expecting to disappear on their own and I will be checked again to make sure. Out of curiosity, I wanted to see if tea had anything to do with the cysts, or if I could drink a tea to help with them. Please keep in mind, I am not a doctor, and I was looking this up for personal usage. According to the LiveSTRONG website, two different teas are sometimes prescribed for those suffering from ovarian cysts – red clover tea and uterine herb tea. Sometimes, herbal teas also make the cut. Why red clover tea? Apparently, red clover helps to balance the hormone levels, which might be a cause of ovarian cysts (thus why birth control is often another method of controlling cysts). This might take 3-4 weeks until any noticeable results. Being that the wait and watch approach is also used (as in my case) and I need to wait a month anyway, this is not necessarily a bad thing, though something to definitely take up with the doctor beforehand. According to Natural Remedies and Cures, uterine herb tea contains cramp bark, motherwort, burdock root, rhizome of wild yam, ginger root, mullein leaves, cleavers leaves, and prickly ash bark. Coming from someone who doesn’t know herbs all that well… what? These ingredients, which can be found at a health food store, are used to clear the debris out of the uterus and help balance the hormones. You can buy it either as a pill, or as the dry ingredients, and should only take as needed and in conjunction with your doctor. Now, the one that scares me a little more – the kidney cyst. The reason why this one is raising red flags is because my cyst is what is called a complex cyst, which can indicate kidney cancer. I am trying not to jump to conclusions and have been sharing this with very few people, but am praying for my doctor’s appointment this Friday. After all, everything on the internet creates cancer now-a-days, right? According to PKD Clinic, green tea can help with kidney cysts due to the fact that there re so many vitamins and minerals contained within. However, that being said, green tea also contains oxylates, which promote the growth of kidney stones. And of course, herbal teas can help as well due to their many benefits. So, that about sums up what is going on in my life and why I haven’t been able to write! I am so sorry about that, and I do apologize for the less-than-substantive articles as of late on my Facebook page. But know that this is getting worked through and, for the time being, things might be more me just posting general updates. I am excited to list that I do have another tea review coming up, though, and I hope to do that sooner rather than later. Each time I have a Tea Love talk, I am always amazed listening to myself and hearing how far Tea Love has come. It just astounds me. This past Saturday, Tea Love had another talk in conjunction with author Ovidia Yu (one of the sweetest people I’ve met!). Ovidia met me in my boyfriend and me in my hometown of Cranford, New Jersey, and we trekked to Voorhees to talk at the Camden County Library -Voorhees Regional Branch. I started the talk, telling everyone about tea culture and tea facts in China, Japan, and Singapore. She wrapped us up by talking about tea culture in Singapore, elaborating on some interesting tid bits from a first-hand perspective. From there, we all drank matcha tea, pulled tea (which everyone kept referring to as “chocolate tea”), and munched on some Asian-inspired goodies. I saw some people from my previous talk at the library, which was wonderful! We talked about what they liked, what they didn’t like, their experiences since my last Tea Love talk, and just life in general. As I talked and explained both Tea Love and my life to people, I was slightly floored. Tea Love started as a result of me not getting a particular job that seemed highly promising. While I had a job, this one was in my field of interest, would have paid very well, and meant working in the City, a huge perk. When I was informed I did not get the editing position that I applied for, I was a bit downtrodden. After all, an English major who has been out of a job for over a year after graduation is never anyone’s cup of tea. Throw on top of that that quite frankly, I have never been without a job in my life, and the pain was there. Rather than sulk, I decided to start a blog and decided to dedicate it to tea. Initially, I heard all sorts of weird reactions (and still do when people learn about my blog). “How much can you even write on tea?” “You’re talking about the drink, right?” “Um… do you sit at home listening to classical music on weekends too?” But now, since 2011, my readership has reached over the thousands, I have working relationships with various vendors, my Facebook page is doing well, and I even got to do a talk with an esteemed author. ‘Teh Tarik’, Malay for ‘pulled tea’, is a favorite old time Singapore roadside drink, so called because it appears pulled between cups as it is dramatically poured between them to cool it and create its characteristic froth. Masala chai or ‘spice tea’ is another popular drink seasoned with a combination of ‘warming’ spices such as cardamom, cinnamon, fresh ginger, fennel seeds, peppercorn, and cloves. Some claim marsala tea stimulates the circulation while calming the digestion and easing sore throats and cold symptoms, but you really need no excuse to enjoy this sweet spiced tea, and it is even more enjoyable as a pulled tea. These local teas are traditionally made with tea dust—the ground up remains of broken leaves. However, if you don’t feel ready to take part in one of the region’s ‘teh tarik championships’ (measuring the greatest distance pulled without spilling), then you can put your condensed milk into a jar, add your hot tea, close the jar, and shake until you get it foamy. It will do you just as much good with much less mess! So, the other day, I was at the mall with my boyfriend and two friends. As we wandered around the mall, I got a craving for (guess what) tea. While I would not have minded some Harney’s and Sons from Starbucks or anything, I was craving for something a little different. Loose tea. Sweeten slightly, but not by much. I wasn’t sure what I wanted, but i knew that it was a good cup of tea. I bought a cup of Main Squeeze from them. The tea consists of green yerba maté, candied papaya, pineapple, safflower, and natural flavoring. So sweet, no sugar needed! Walking around the mall, I think I finished it off in twenty minutes and that was more because it was too hot to drink at first. After my free Godiva chocolate piece, we wandered into Teavana. Thanks to my church, I had two gift cards of an unknown amount. Why not use them? The workers scanned the two gift cards and found out that they totalled *drum roll please* $40! On top of that, select teas were reduced price as a result of preparing for the next season of tea! I bought $20 each of Jasmine Dragon Phoenix Pearls green tea, which consists of a light sweet taste when the pearls unfold, as well as a Dragonfruit Devotional herbal tea (which, by the way, my boyfriend and I are drinking now while watching Phantom of the Opera). Talk about another delectable tea 🙂 Needless to say, I am quite please with my purchases. Happy Mother’s Day From Tea Love! First and foremost, I want to thank the Fairfield Free Public Library for hosting me this past Thursday! It was another wonderful group with some insightful guests. Unfortunately, I did arrive a little late but everyone was very gracious, gave me ample time to set up, and I think we had a lovely conversation. I got to hear from people who brewed tea in an Indian fashion – strong with milk – people who had Kombucha tea (which they said was delicious), and others who absolutely hated tea but was willing to give it a try (he said he would always be a coffee drinker at heart, but I am glad he at least gave it a shot!). We talked about the affect that the staple and glue has on a cuppa (while I found no evidence swaying either way, try and use loose tea anyway) and how green tea can assist with weight loss. Second, I have another Tea Love talk coming up! Finally, onto a fun topic that I wrote about for the Riverdale, New Jersey newsletter – dying Easter eggs using tea. Everyone knows that tea stains. Teeth whitening commercials always address those pesky coffee and tea stains on your teeth that will be magically removed with one application of their fine product. Clothing commercials feature red wine, coffee, and split tea mugs dashed across lily-white table clothes, only to be removed with the power of baking soda, peroxide, and awesome stain-fighting power. But, with Easter just around the corner, children and adults alike can use the staining power of tea to make their own tea-infused eggs. You can dye the eggs with one of two methods – the standard dip method where, rather than use food coloring tablets, you would use tea, or a method where you can give the eggs a marbled look. To use the standard sip method which will produce an egg similar to your other Easter eggs, take your eggs and put them in a mixture of a tablespoon of vinegar, a cup of water, and a very strong-colored tea such as a raspberry herbal. Allow it to soak refrigerated for a minimum of two hours, though the longer you leave the egg in the tea, the stronger the color will be. When you take the eggs out and start eating them, you should get a slight taste of tea with each bite. For a different look, you can also try the tea egg method. 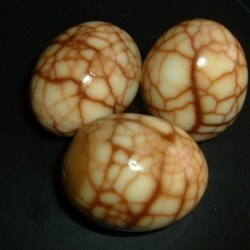 According to blogger Ellen Easton, writer of Tea Travels, the tea eggs, also called marbled eggs due to the marbled look they get when they are shelled, are sold in Asia as tasty snacks or appetizers. One can often find them on the streets being sold by vendors, though you can also find it in the restaurants and even convenience stores as well. According to blog Appetite for China, to create these, hard boil the eggs prior to dying. When the eggs are cool enough to handle, gently crack the eggs either by rolling them in a paper towel or by tapping them all over the shell with a spoon. You want to be careful not to break any of the shell off the egg so that you get the cracks and lines but not a huge splotch of color. Put the eggs back into the water and add two tea bags of black tea, ½ cup soy sauce, 1 tablespoon of light brown sugar, 2 pieces of star anise, 1 cinnamon stick, 1 teaspoon of cracked black pepper, and 2 to 3 strips of dried mandarin peel. Cover the eggs by an inch, then bring the water to a boil. Lower the heat then to a bare simmer, and allow the eggs to stay for at least one to two hours or until you reach the desired flavor and color. When you are ready to serve, get the camera and watch the pleasant surprised faces as people get to see your lovely creations. Pumpkin Spice EVERYTHING Season Is Back!